Like many of villages in rural Ireland, Stoneyford was facing its demise in the late 1960’s. Arising out of this sad fact the people of Stoneyford formed The Stoneyford Development Association in 1970. The purpose of the association was to develop a focus in the village which would cater for all. It was decided to build a Community Centre with outdoor playing facilities for young and old i.e. a playing pitch, a running track, a Children’s Play Area etc. Eventually, following years of effort, work began on the construction of the community hall. The work was mainly done on a voluntary basis and the Hall and Pitch were opened in 1990. Since then the hall has been the focus of community activity with Bingo, Drama, Fit Club, Indoor Soccer, Computer Classes etc. In the early years it was the home of the local Foroige club who went on to win many national awards during the 90’s. At this time Badminton was a very popular sport in the hall and was played by many members of the local community. In recent years the hall has been refurbished to a very high standard. It now contains a theatre, a cinema room with full cinema sound and projector, meeting halls, office space, Cafeteria and more. The hall also became the home of a thriving drama group, Stage Door which caters for a large number of children from the ages 4 to 16 from both Stoneyford and its neighbouring parishes. How has Stoneyford fared in the intervening years between the 1970s and today? Well the report has to be a mixed one. The population has grown and there is now a thriving self-sustaining community in Stoneyford. 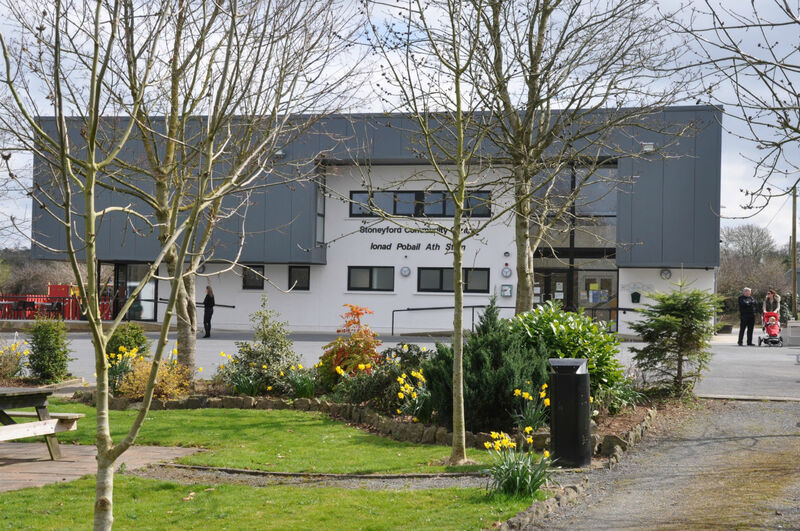 The school was not closed, in fact Scoil Chiaráin Naofa has expanded and modernised. However after a concerted effort and two attempts the powers that be finally succeeded in closing down our Post Office, what a shame. It is not now possible to post anything larger than a letter in Stoneyford; it is rather difficult to send a parcel by email! Our Garda Station was closed suddenly in a rash of rationalising and cut backs by the state. Worst of all there is no public transport servicing Stoneyford or its environs. We have what can only be described as patchy mobile phone service and a shamefully poor broadband infrastructure. It would not be true to depict everything that has happened in the intervening years as negative. Stoneyford is now serviced by a fantastic motorway, which can be easily accessed either at Danesfort or Knocktopher. In effect this give us a speedy and safe road access to any part of the country. A side effect of the motorway is that Stoneyford Village is bypassed thus rendering our main street a safe environment for all, and at the same time opening up the village to any passing motorist who might want a break from the tedium of a long drive. It must also be said that St. Brendan’s catholic church, which celebrates its bi-centenary in 2015, has a thriving community and like the school has a bright future. The people of Stoneyford are a progressive and forward-looking people. They are refusing to be ignored and neglected and in recent years progress has been made. Stoneyford and its people look to the past with pride and face the future with hope.